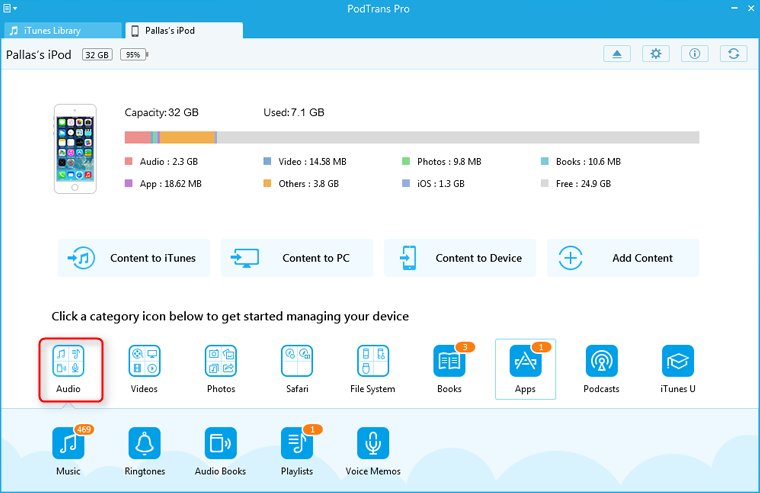 PodTrans Pro allows you to export iPod media files like music, video, iTunes U, books to iTunes, computer, and other iPod devices. Browse the image below, you can see various kinds of files. Just choose you wanted items to begin sync process. The following is an example of transferring music. If you want to transfer other media files, like video, iTunes U, books, etc, the steps are the same with music. Step 1: Open PodTrans Pro, then click "Audio" option on the interface to choose music. 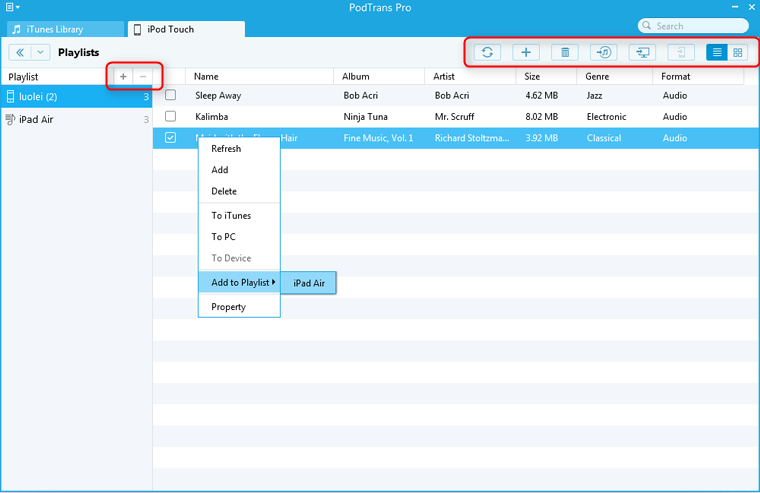 Step 2: When you pick up one or more music from this interface, you can refresh, add, delete, and transfer them to iTunes, computer and device. Just click the corresponding buttons on the top-right corner. On this interface, if the music on your iPod is grayed out, and it indicates the music file does not exist. If you just connect one iPod to computer, the option from iPod to iPod will show gray. While if you connect two iPod devices to the computer, you can begin to transfer music between iPod devices. 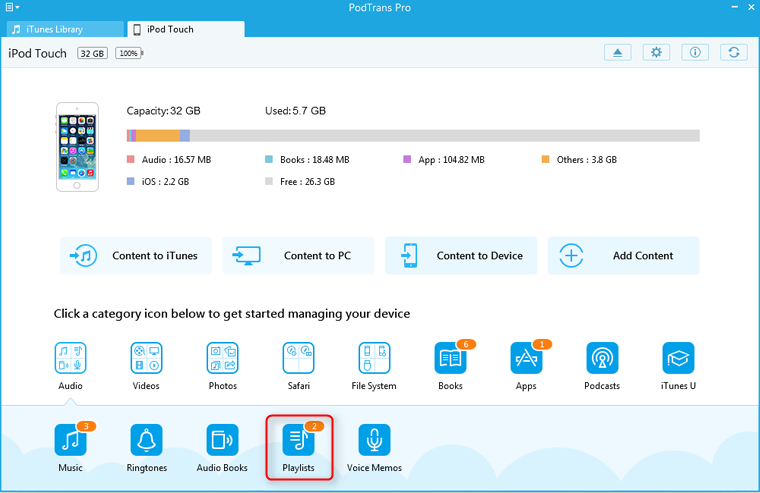 How to Add/Delete Playlists on iPod Device? 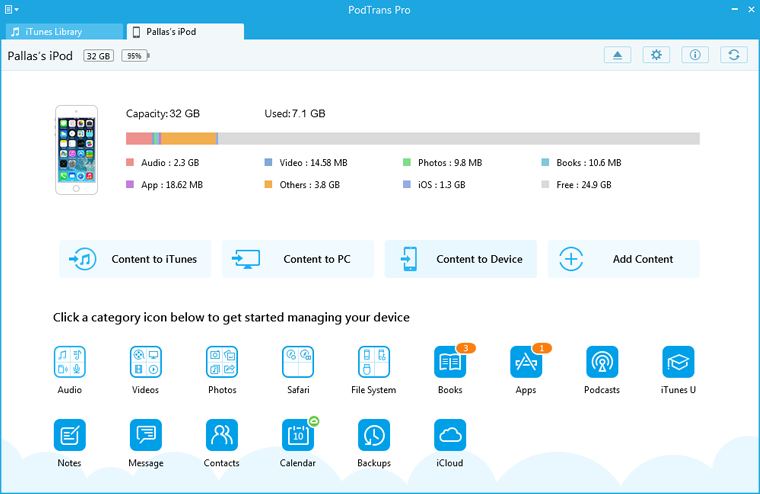 Step 1: Launching PodTrans Pro after connecting your device to the computer. Then, click "Audio" button and you can see the "Playlists". 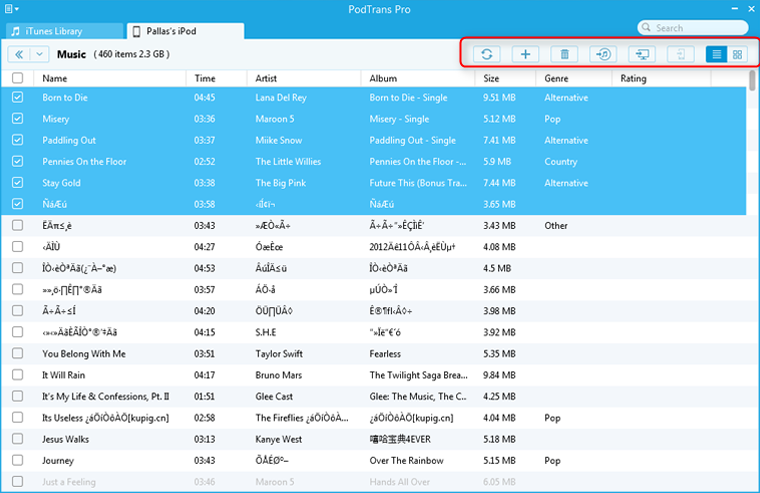 Step 2: The playlists are displayed on the left part of PodTrans Pro and with options of adding and deleting. If you want to edit the playlist, please right-click the target one. On the right part, the songs are able to refresh, add, delete, to iTunes, to computer, to iPod device. Right-clicking one or more songs, you can add the present song to another Playlist.